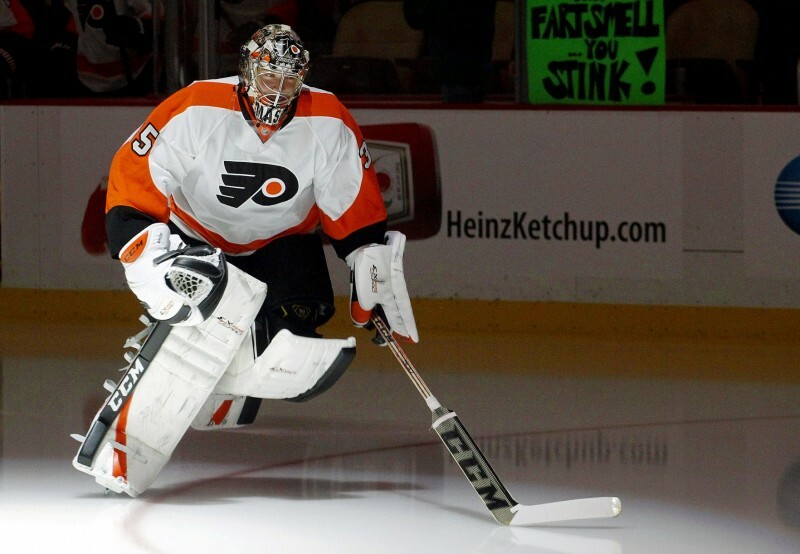 Steve Mason, 'Run of The Mill Goalie' or Vezina Candidate? Steve Mason, ‘Run of The Mill Goalie’ or Vezina Candidate? It’s no secret. The Flyers underachieved this season. No one expected them to be a presidents trophy contender. That being said, they fell short. Shootout losses, losing to very bad teams, and bad decisions just kept adding up. In fact, in their last 23 games, the Flyers are 0-6-5 against non-playoff teams, and 8-1-3 against playoff teams. Talk about what could have been. All shenanigans aside, let’s talk about Steve Mason. There isn’t any two ways about it. Sunday’s performance was one of Steve Mason’s best outings thus far in the orange and black. The Penguins fired 47 shots his way, and only one got past him. These weren’t measly shots either, the Penguins had their fair share of good scoring chances and sustained offense pressure. Mason stayed calm, cool, and collected through it all. Even after the game, he was humbled in the locker room. That’s reflective of how he has handled himself on and off the ice all season. That was his best on the day. However, that wasn’t good enough for NBC commentator Mike Milbury, who labeled Mason a “run of the mill” goalie. Not to mention NBC’s 1st intermission headline that Mason was “Good, not great”. Just a run-of-the-mill save there… nothing to see. If you ask me, 21 saves in the first period is a little bit above average. Just a little. If you ask me, 46 saves on 47 shots is pretty good, I’d argue that it’s great. So when is Mason going to get the credit he deserves? (.929). That’s absurd in the best sense of the word. Those stats put Mason in the company of Carey Price, Pekka Rinne, and Henrik Lundqvist. Those are elite goalies who have good defenses in front of them. Just how much has Mason kept the Flyers in games? The Flyers have been in 42 one-goal games this season. They are dead last in the NHL in one-goal game winning percentage (.333). They have lost 28 of their 42 one-goal games. How can you relate that to Mason? The Flyers are also 21st as a team in goals per game, so they getting a ton of offensive support. They are also near the bottom of the league in shots-against per game (21st at 30.3), so it’s not like Mason isn’t seeing a substantial amount of rubber. He is the reason they’ve been in so many close games. When you look at the team stats, and then compare them to Mason’s, it truly is amazing how good his numbers are. Now, skeptics are going to hang Mason’s 17-17-11 record over his head, but that really isn’t indicative of Mason’s individual play this season. It’s easy to say “what if?”, but if Mason had a marginally better defense infront of him, it’s hard not to think that he could lead the league in both goals against, and save percentage. Will Steve Mason win the Vezina? Probably not, just because of Carey Price. Should Steve Mason be getting the credit he deserves? Absolutely, and it’s about time we start labeling him a Vezina candidate.